Girls' Love Stories: Black + White = Heartbreak! To that I can say a resounding yes! Though I do not know if "Black + White = Heartbreak!" 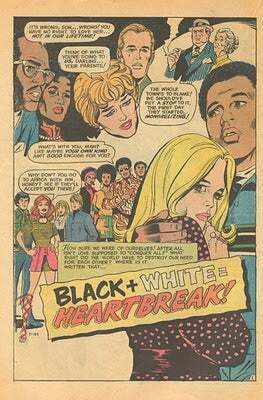 is the first interracial relationship in the entirety of the comics medium, it does predate "Full Hands Empty Heart!" Chuck announces their plans for marriage, completely shocking both of their parents - and Margo! They decide to set out right away to look for a place to live, so that they can get married before the fall semester starts. During their apartment search, they are continually harassed by folks who are opposed to their relationship. They are subject to discrimination by landlords who will not rent them an apartment, and Chuck and Margo eventually have to consider settling on a complete dive. As the lovebirds go to tell their parents they have found a place and are going to get married right away, they overhear their fathers - who were once the best of friends - arguing. Margo and Chuck can't bear the strain they have put on their loved ones and Chuck proposes going away to a place that will accept them and their love. Welcome back for a second installment on the fate of lovers Margo and Chuck! We left off with a cliff hanger of a story. Margo and Chuck. Lovers from different racial backgrounds, united in their deep and undying love for one another. Friends since childhood, these two lovers had to make a choice - stay around their friends and families who demand they part ways, or stay together and leave everything and everyone they have ever known behind. At the end of the sequential story in Girls' Love Stories #163 (November 1971), readers were ask to send in their version of the fate of Margo and Chuck for cash prizes. The above solicitation appeared in Girls' Love Stories #165 in January of 1972, letting readers know they could still enter into the contest. As I mentioned in the first part of the Margo-Chuck saga, I don't have the issues that contain the readers' entries, issues #166 (February 1972) and #167 (March 1972). Lucky for us though, the ever so kind Gene Kehoe - editor of It's A Fanzine, has #167 and was so very gracious to send me a scan of the contest page. As we move on to the second wave of fan endings, lets give a mighty round of applause for Gene!!! Hooray!!! This post originally appeared on the blog Sequential Crush, via Racialcious. Reprinted with permission.